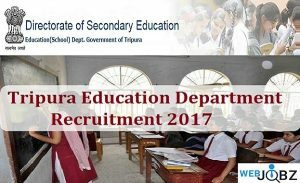 Tripura Education Department Recruitment 2017: Government of Tripura, Education (School) Department, Agartala has published their recent notification for the various vacancies. 12000 vacancies has announced for position such as Programme Assistant, Student Counsellor, Academic Counsellor, School Library Assistant, Hostel Warden, vacancies on temporary basis. Want to know more details? Now you can check below. Tripura Board of Secondary Education (TBSE) (Bengali: ত্রিপুরা বোর্ড অফ সেকেন্ডারি এডুকেশন) is a board of school education in state of Tripura, India. It is a state agency of the Government of Tripura which is responsible for the promotion and development of secondary education in the state. Most of the public schools of the state follow the TBSE system. Tripura Board of Secondary Education was established in the year 1973 under the Tripura Act. No.12 and named after Tripura Board of Secondary Education Act, 1973 by Tripura Legislative Assembly. The board came in operation from the year 1976. This Board is also providing higher education and granting to its affiliated schools. Graduation details: Applicant should have Honours/ Postgraduate Degree for Post 1, Graduation Degree for post 2 to 4, have passed Madhyamik or its equivalent examination for Post 5 from any perceived University/ Board with appropriate experience.